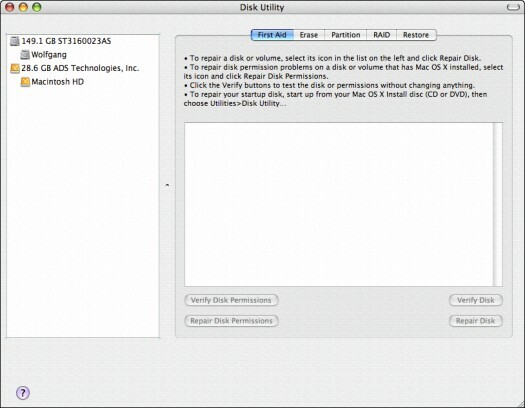 An important application in your maintenance toolbox is the Disk Utility, which is located in the Utilities folder within your Applications folder. When you first run this program, it looks something like Figure 1, displaying all the physical disks and volumes on your system. Figure 1: The familiar face of Tiger’s Disk Utility. The Disk Utility application has its own toolbar that you can toggle on and off. Click the lozenge-shaped button at the upper-right corner of the window to display or hide the toolbar. The volume tree structure on the left of the Disk Utility window lists both the physical disks and the partitions that you’ve set up. A partition is nothing more than another word for volume, which is the formatted section of a disk that contains data. A single physical hard drive can contain several partitions. The information display at the bottom of the Disk Utility window contains data about both the volumes and the partitions on your hard drive. To illustrate: Clicking a drive labeled at the top of the tree displays a description of the drive itself, including its total capacity, interface (connection type), and whether the drive is internal or external, as shown in Figure 2. Figure 2: Display data on a physical drive. Clicking the tree entry for a partition, however, displays information about the type of formatting, the total capacity of the partition and how much of that is used, and the number of files and folders stored on the partition (see Figure 3). Figure 3: Display data on a volume. The start-up disk: Disk Utility can’t verify or repair the start-up disk — that’s Mac talk for the boot drive that contains the Mac OS X system that you’re using at the moment — which makes sense if you think about it because that drive is currently being used! If you have multiple operating systems on multiple disks, you can boot from another Mac OS X installation on another drive to check your current start-up disk. Or, you can boot your system from the original Mac OS X installation CD and run Disk Utility from the Installation menu. Your start-up disk is automatically verified and repaired (if necessary) during the boot procedure, so you really don’t need to worry about checking the start-up disk. Write-protected disks: Although you can use the Disk Utility to verify CDs, DVDs, and write-protected removable disk drives (like a write-protected Zip disk), it can’t repair them. You also can’t repair a disk that has open files that are currently being used. If you’re running an application from a drive or you’ve opened a document that’s stored on that drive, you won’t be able to repair that drive. You can also elect to verify and repair permissions (also called privileges) on a disk; these are the read/write. If you can’t save or move a file that you should be able to access, check that drive for permissions problems. Unlike fixing disk errors, you can verify and repair permissions on any volume that contains a Mac OS X installation (whether it was used to boot your Mac or not).